Mullein (Verbascum thapsus) is a medicinal plant of fields and waste places. Its easy to recognize by its soft, fuzzy leaves, and tall flower spike. This medicinal plant is a biennial and grows a soft rosette of succulent, fuzzy leaves in its first year. In its second year, or sometimes during Indian summer, after a cold snap, the low growing Mullein rosette will begin to differentiate into a flower stock. The Mullein flowers form a tall spike, covered in individual yellow flowers that open one at a time over a month or so in mid to late summer. Mullein is an easily identifiable medicinal plant. Mullein is generous as a natural dye plant, being rich in tannins and flavins. But it is also a generous medicinal plant. It is a specific natural remedy for bronchitis, and heavy coughing. Mullein has expectorant properties, as well as being anti-inflammatory. Harvest the Mullein flowers during the summer and early fall as they open, or cut off the whole flower stock in late summer, before the flowers turn brown. Chop and steep in warm oil. Once the flowers have turned brown their medicinal properties are severely lessened. Mullein flowers are a well known, gentle remedy for childhood ear aches. Harvest the Mullein leaves at the end of the season, from first year plants that are still succulent. Dry away from heat and sun for use in tea, or chop finely and soak in vodka or cider vinegar to make a tincture. 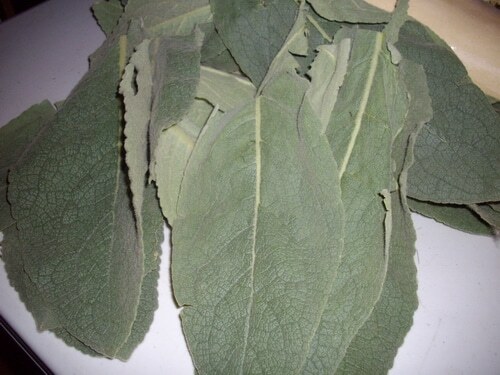 Dried Mullein leaves may be ground in a mortar and added to capsules to be used in pill form, as well. Mullein is a specific remedy for earache, bronchitis, coughing, sinus congestion, chest congestion and wheezing. It promotes sweating and will help break a fever. This encourages the removal of toxins and waste from the body. Mullein is considered a major anti- inflammatory herb. Mullein can be used in the treatment of swollen joints and arthritis. Macerate the flowers in oil, and allow to sit in a warm place for two weeks. Strain out the leaves. Add vitamin E oil (natural source) to preserve, if desired. Label, date, and store. To use Mullein for the treatment of sore joints, rub mullein oil thoroughly into skin. Cover with a dry dressing. A liniment of Mullein can be made by pouring boiling cider vinegar over mullein leaves, cover, and simmer slowly for 30 min. Strain. Massage into swollen joints. Mullein also soothes inflammation in the chest, throat, and sinus. Mullein leaf infusion or tea is the most effective. Use mullein flower oil to sooth inflammation in cases of ear ache. Use with tea tree essential oil or lavender essential oil for their anti-bacterial properties. Mullein leaf extract and tincture relaxes the bronchial tract and to relieve coughing, while loosening phlegm. It does this without sedation, making it a good cough remedy to use with children. Mullein tea is thought to be more effective than the pill form, for this. It’s the tannin in Mullein that is responsible for its astringent properties. Astringents are important for wound healing, for reducing irritation on the surface of tissues. 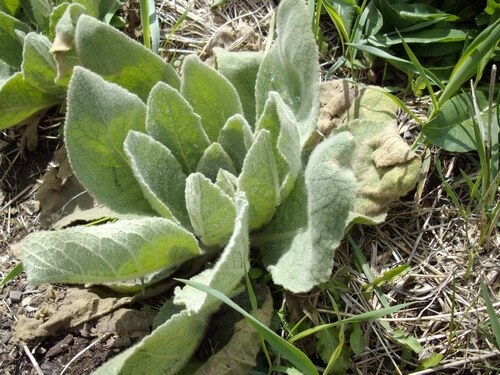 In mullein’s case it works especially in the throat and upper respiratory tract. It reduces surface inflammation, and creates a barrier against infection, especially useful in colds and flu. Mullein breaks up mucous in the nose and throat. It makes mucous more liquid to make it easier to expel from the body. It relieves stuffy nose and makes it easier to cough up mucous from the lungs. While you can dry leaves, grind them in a mortar and fill capsules with the remedy, it is fast acting and more effective to brew an infusion of the dried leaves and drink it as a tea with honey (add ginger and lemon to boost your immune system, too). Mullein works as both as an expectorant, by relaxing the bronchial passages to relieve coughing, and by stimulating the expulsion of mucous form the lungs. Mullein increases the elimination of toxins through urine and through sweating. Mullein supports the process of inner cleansing. 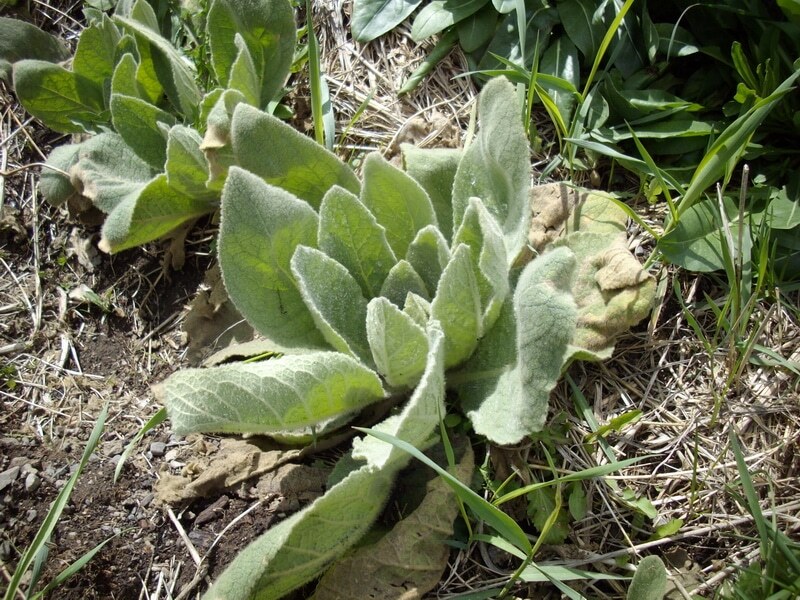 Mullein is rich in mucilage and can soothe and protect irritated and inflamed tissues. Mullein has this action on the throat, and lungs as well as the upper digestive tract, when it is used as a tea. This is the property of mullein that eases coughing. Mullein is a tonic for the respiratory system and will strengthen and restore the whole body during colds and flu, through the synergy of its actions. Mullein promotes wound healing. 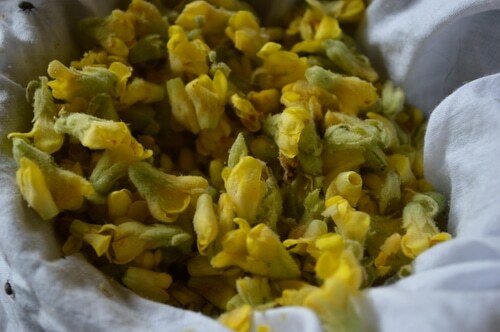 Use mullein oil made by steeping the flowers in warmed olive oil, for 2 weeks. Strain and use liberally on cuts, scrapes, and wounds. 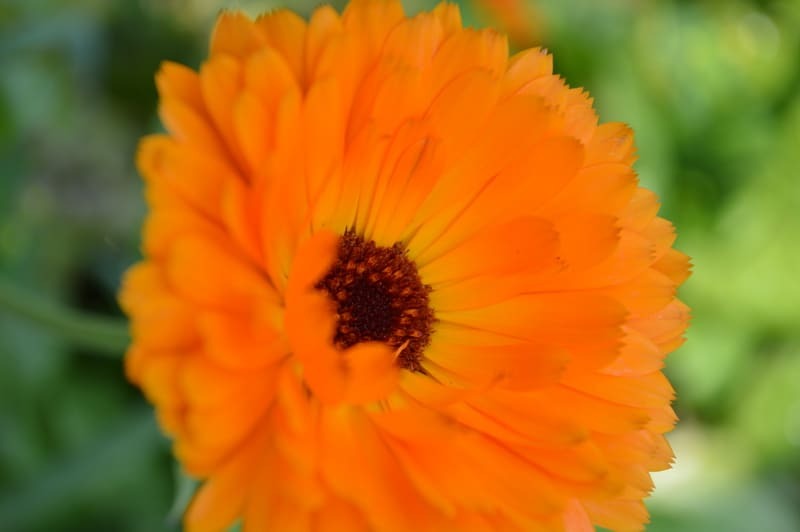 This is good mixed with calendula flowers. Mullein increases perspiration to help the body eliminate toxins through the skin. This helps in treating the fever that can accompany cold and flu symptoms. If you have livestock, you’ll notice that goats, sheep, and cattle don’t eat mullein leaves. The leaves are covered in tiny, soft hairs that irritate their mouths, and so they avoid it. So even in the fall, you should find lots of mullein leaves to harvest in your farm fields. If you are harvesting Mullein in Spring, wait until mid summer, as the leaves need some strong sunshine to renew their medicinal properties. Harvest single flowers as they open on the stock. For this reason, you want to encourage a field of mullein in your pastures, as you will need many flowers to make a single jar of mullein oil, and by harvesting a large field, you can get enough flowers in one or two pickings to make it worth while. Mullein was also called witches candle, because a torch can be made by dipping the dried flower stocks in tallow and lighting them on fire. 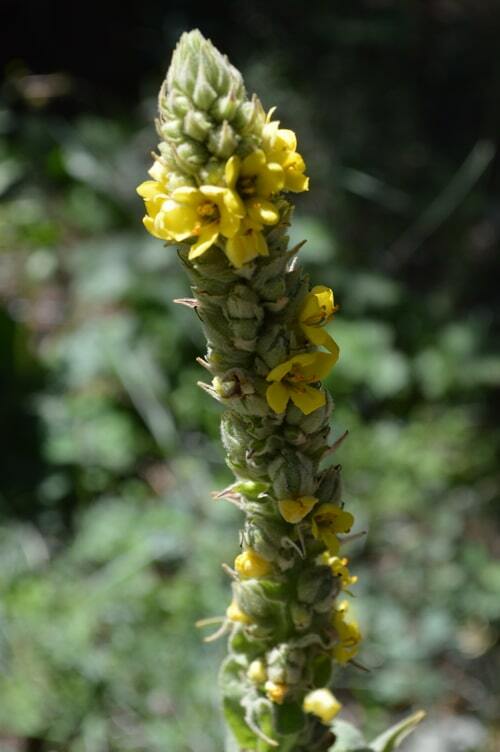 There is a fine fiber in the centre of the mullein stalk that can be twisted into cordage for use as candle wicking. This was a traditional use of the stalk. The leaves, the flowers, and even the fiber from the centre of the stalk is useful. 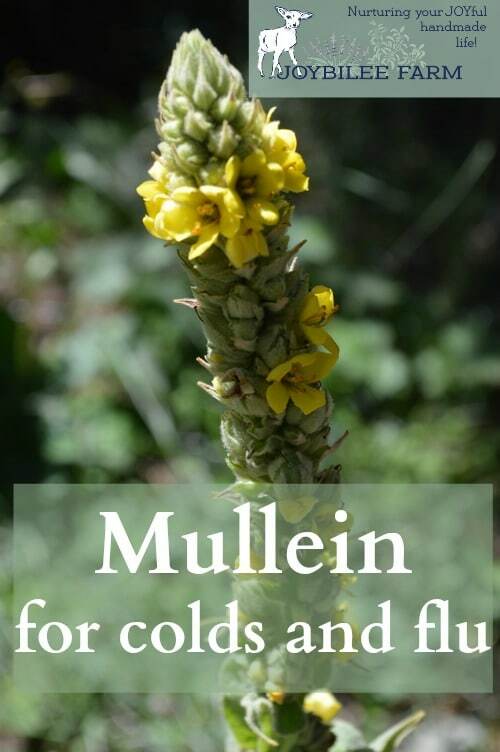 Use mullein for medicine, for natural dye, and to meet practical needs. I’ve just found some local Mullein (tall second year plant)… are those leaves suitable for foraging or should one’s pick only the “rosettes”, first year plants. I am also hoping to gather some of the flowers for infusing. Both first and second year leaves are suitable. I am wondering if I can add mullein to elderberries for syrup. Should I use the leaves or the flowers? Yes you can. Leaves are normally used. I bought myself a 1 fl. oz (30 ml.) bottle of Mullein extract and I added the entire bottle to a 16.9 fl. oz (500 ml)bottle of water. In other words this is my first time using this product and I don’t know if I’m doing the right thing by drinking whole little bottle. Help me! I need a better understand on using Mullein. I do have the flu and bronchitis..
No that isn’t the right way to use that product. You’ll want to add just 1 teaspoon to a glass of hot water and sip it or follow the directions on the bottle. (You should have at least 6 servings in the 30 ml bottle) Did the bottle not have a serving size or dose listed on it? But you didn’t harm yourself by taking the whole bottle. You will want to use it in warm water and drink it like tea, a little bit at a time. There are other herbs that might help you as well such as oregano, thyme, ginger, elderberry, garlic, and onions. Im drinking Mullein tea few times a week and the effetcts are amazing!!! Im looking for the Mullein tea and pills. I don’t have my thyroid glands; so hopefully I’m making the right choice.